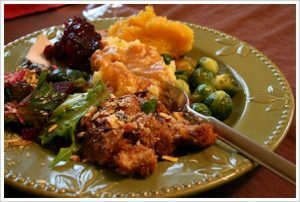 Simple Thanksgiving Recipe, Holiday Cookbooks and More! Roast 4 acorn squash by slicing them in half, scooping out the seeds, rubbing the cut surfaces with olive oil and roasting them in a 350 degree oven until soft when poked with a fork. Scoop out the soft flesh and whiz it in the food processor until smooth. Add 2 tbsps of melted butter, 1 tsp salt, 1/2 tsp finely chopped fresh rosemary and 1/4 cup of sharp Samish Bay Montasio cheese. 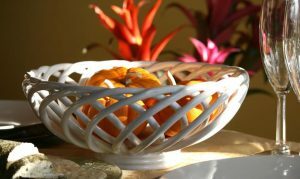 Place the squash mixture in a small Pyrex dish, dot the surface with butter and bake in a 350 degree oven until warm and the top begins to brown around the edges. 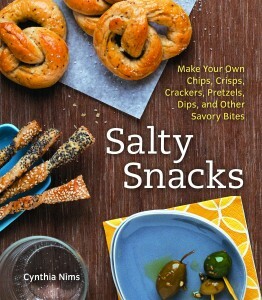 Kim O’Donnel Meat Lover’s Meatless Celebrations, Cynthia Nims Salty Snacks (Can you say mustard soft pretzels?! ), and Jeanne Sauvage Gluten-Free Baking for the Holidays. Imagine, Meat-Free Thanksgiving menu ideas…Salty chips, crisps, pretzels and dips to snack on before dinner…Gluten-free desserts, rolls and more! Be sure to check out their wares at Click’s Cookbook Sample Party on Thursday, November 15th from 6 to 9pm! Check our Holidays page for more information on Holiday events, shopping and dining options in The West Seattle Junction.